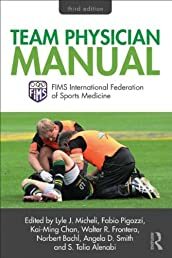 The FIMS Team Physician Manual is the official sports medicine handbook of the International Federation of Sports Medicine (FIMS), the world’s oldest sports medicine organization. Now in a fully revised and updated third edition, the book offers a complete guide to the background knowledge, practical techniques and professional skills required to become a successful medical practitioner working in sport. Well illustrated, with clear step-by-step guidance, plus text boxes and checklists for quick reference, the Team Physician Manual covers every key area of activity and intervention, from the preparticipation examination to rehabilitation. The book surveys every classification of sports injury, offering clear advice on fieldside assessment, diagnosis and treatment, as well as examining best practice in general aspects of sports medicine, such as prevention and the psychology of injury. Written by a team of world-leading physicians from North and South America, Europe, Africa and Asia, this book is a ‘must have’ reference for any doctor, physical therapist, or medical professional working in sport.